Pro-Russian men armed with clubs gather outside the Crimea regional parliament building in Simferopol, Ukraine, after parliamentarians voted for a May 25th referendum on Crimea’s autonomy earlier Thursday. SIMFEROPOL, Ukraine – Masked gunmen on Thursday seized government buildings in the capital of the Crimea region of Ukraine, barricaded themselves inside and raised the Russian flag, raising the specter of a separatist rebellion that could tear the country apart. Further inflaming an increasingly volatile situation, Viktor Yanukovych released a statement Thursday saying that he remained the lawful president of Ukraine and appealed to Russia to protect “my personal safety.” While his precise whereabouts remained a mystery, Russian news agencies reported subsequently that Yanukovych would hold a news conference today in Rostov-on-Don, a city in southern Russia, six days after he was driven from power by mass protests and fled from Kiev, the Ukrainian capital. Local police officers in Simferopol, the Crimean regional capital, sealed off access to the government buildings, including the regional parliament, which were seized in mysterious overnight raids by people who appeared to be militant ethnic Russians. Crimea has been a source of tension between Ukraine and Russia for decades: the territory was transferred to Ukraine by the Russian Federation when they were both components of the Soviet Union in 1954, and Ukraine retained it when the Soviet Union collapsed in 1991, though Russia still maintains important military bases there, including the home port of the Black Sea Fleet. Oleksandr V. Turchynov, the speaker of Parliament and acting president of Ukraine, urged Russian military forces early Thursday not to stray out of the designated Russian military zones. Arsen Avakov, Ukraine’s acting interior minister, said the new government was taking unspecified measures “to counter the extremists’ actions and prevent an escalation of an armed conflict in the center of the city.” It was unclear, however, how much authority Avakov has over the police and other government agencies in Crimea, where many in the heavily ethnic Russian population view the ouster of Yanukovych as a fascist coup. In his statement, Yanukovych warned that the largely Russian regions in eastern and southern Ukraine, including Crimea, would “not accept the anarchy and outright lawlessness” that has gripped the country. Whether he can cling to any part of his former power remains far from clear. Members of his own party have deserted him, and the Ukrainian parliament impeached him and moved Thursday to approve an interim government, with elections for a new president planned for May. Yanukovych’s remarks were his first since Saturday, when he appeared in a video that apparently was recorded in his political base in eastern Ukraine. Even in his diminished and humiliated position, with journalists and ordinary people traipsing through his presidential palace and sorting through incriminating records, Yanukovych asserted his authority over the country’s armed forces and warned that they should not be called in to quell the apparent rebellion in Simferopol. Russia has denounced the political upheaval in Kiev and refused to recognize the new interim government, but officials have also insisted that Russia would not intervene, even as it began a major military drill on Ukraine’s doorstep. Granting sanctuary to Yanukovych even as he claims to lead Ukraine would nonetheless deepen the confrontation with Europe and the United States. 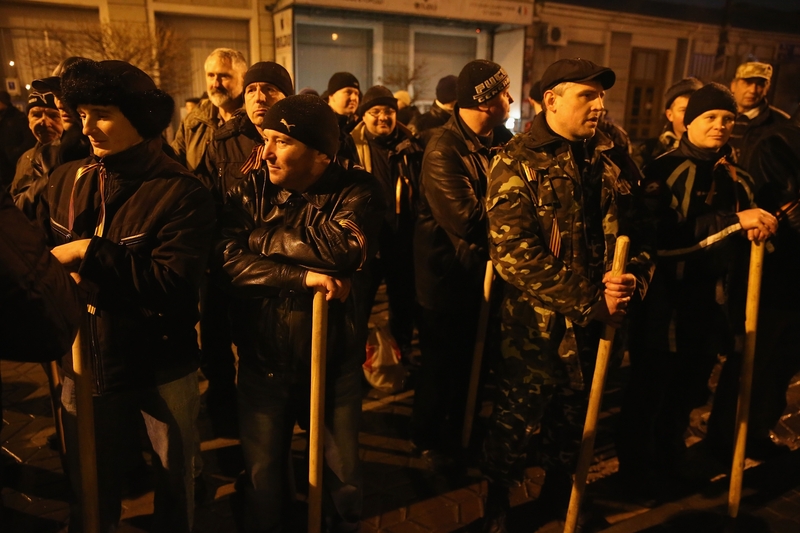 The overnight raids in Simferopol created an ominous uncertainty here and left residents stunned. The raids took place just hours after thousands of Crimean Tatars, the region’s minority indigenous Turkic population and a separate throng of ethnic Russians staged competing rallies outside Crimea’s regional parliament. The rallies, which ended in a melee and left several people injured, disrupted a session of the regional parliament that hardline pro-Russia groups had hoped would declare Crimea’s secession from Ukraine. “This is the first step toward civil war,” said Igor Baklanov, a computer expert who joined a group of anxious residents gathered in a cold drizzle at a police line near the seized regional legislature. Rumors swirled of Russian troops on the way from Sevastopol, the headquarters of Russia’s Black Sea fleet, of Russian nationalists arriving in force to reinforce the blockaded government buildings and of negotiations between the local authorities and the unidentified gunmen. “Nobody knows who, what or why,” said a resident who identified himself only as Gennady and who voiced alarm that the armed action could set off a spiral of violence in a region riven by political, ethnic and religious differences.